the way your putter swings. Putters come in all shapes. A common distinction is at the putter head. From double bends to hosels to straight-in shaft connections. Should you care about how your putter head connects to the shaft? Personally I putted for years without any thought about the purpose of the hosel on my putter. In fact, my current putter doesn't even have a hosel. So what is a hosel? In short, it is an extension of the putter head in which the shaft of the putter can be inserted. Previously it was welded on. Now it is mostly formed during the milling or casting of the putter head. As mentioned not every putter has a hosel as a straight-in shaft can enter the putter head directly. For those putters designed with a hosel, there are different combinations of shape, length, and location depending on what the maker wants to achieve in the balance and dynamic performance of the putter. When you go looking for a new putter, you will often notice that the top line of the putterface is set back from the shaft. This offset helps to keep your wrists ahead of the ball at impact. In earlier years when golfers used a more wristy putting action this design feature was not common. The amount of offset differs, but normally it is the width of the shaft. The most copied putter hosel is known as a plumber's neck. 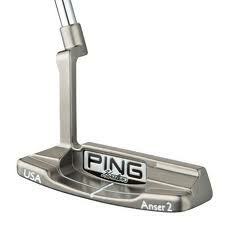 This was made popular by Karsten Solheim in his original Ping Anser putter and set the standard for other putters. Now there are long, mid, short, and slanted plumber's hosels as well as other shapes, all of which subtly change the balance and performance of the putter. If you are looking to minimise the error of breaking your wrists, offset can also be achieved without a hosel by curving the putter shaft. This is done by using a double-bend shaft. However, the real issue in choosing a putter is how well it matches your eye and your putting style. In broad terms putters are typically face balanced, full hang, or some combination in between. The amount of toe hang, if any, depends on the orientation of the shaft to the center of the putter as well as the weighting in the toe and the heel. Putters at manufacture are usually polar weighted (equal weighting in the toe and heel), but some now allow you to create unequal weighting with individual sole weights. Ping with their Precision Milled Anser range have designed models that are suited to three different categories of golfer - those with minimum arc in their putting stroke, those with a slight arcing stroke, and those with a strong arcing stroke. The varying degrees of balance are achieved by employing a variety of hosel types and hosel lengths. Yes! Golf markets two putters with interchangeable hosels that allow you to customise the look and dynamic balance of the putter. The general idea is that the greater the arc in your stroke, the more toe hang you need. In the final analysis the acid test for any putter is how well you putt with it. Nevertheless, with some knowledge about the function of the putter hosel, you may be able to narrow down your search for a putter that has both the look, feel, and the swing dynamics that you need.